Current RF401A and RF411A firmware. Requires the Device Configuration Utility. There is a good chance that they would. 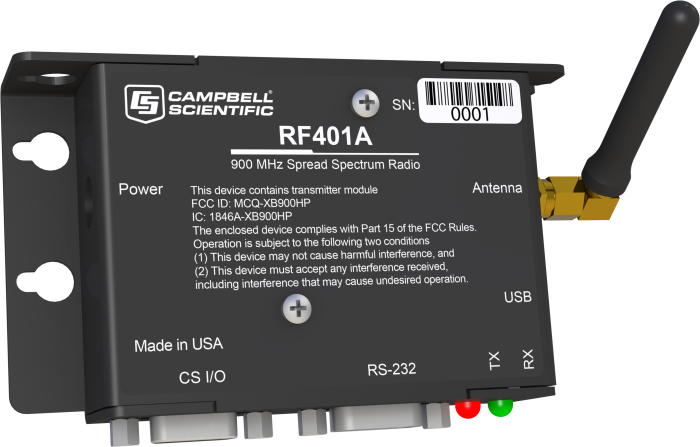 However, the RF401A radios have been designed to work with Campbell Scientific data loggers. There are more generic spread-spectrum radios (off the shelf) that are designed to work in this type of configuration. Can the RF401A be used in an RF400 network? Yes. The RF401A protocol needs to be set to transparent, which will communicate with the RF400 devices. However, if there are RF400 devices that are set to addresses of 28, 44, 52, 56, or 60, they must be changed when the RF401A radios are added to the network. Is it possible to configure the RF401A as a stand-alone router? The RF401A can be powered either from a 12 Vdc source via the field power cable, or from a data logger via the CS I/O port.